What a weekend! Exhausting and exhilarating and wonderful. And all done without my talking. So what happened? 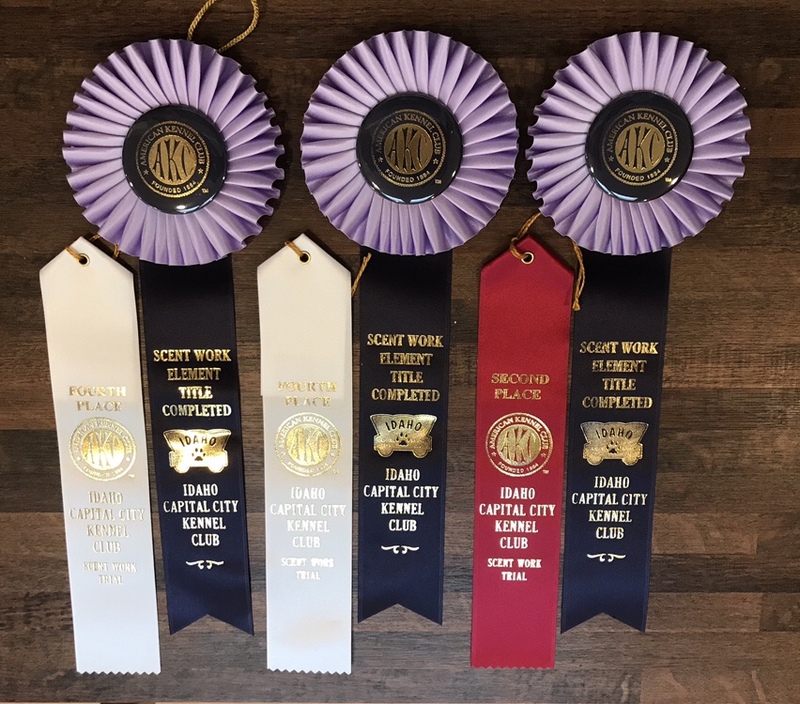 Well, the short answer is that this weekend at the Idaho Capital City KC Scent Work trials, Carlin earned three AKC titles: Scent Work Interior Novice (SIN), Scent Work Exterior Novice (SEN), and Scent Work Containers Novice (SCN). He also qualified in one Novice Buried search. 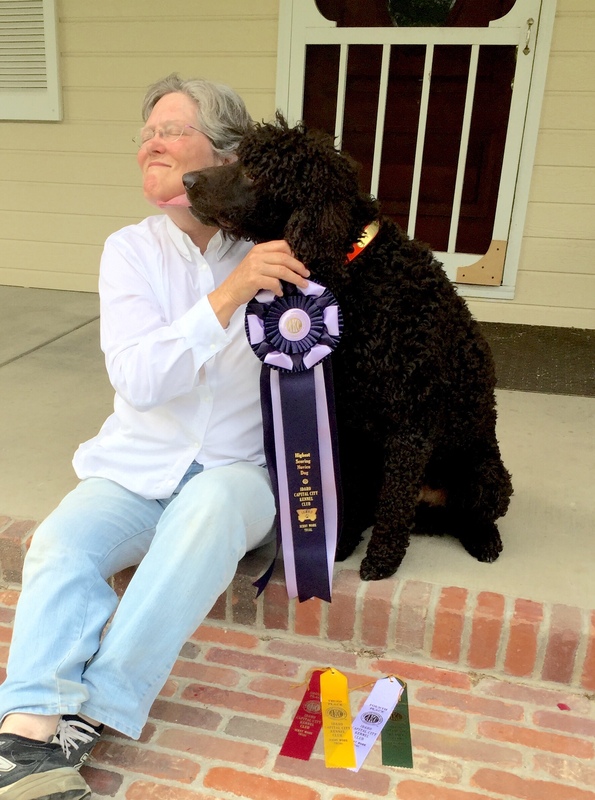 And, on top of all that, on Saturday, he won High In Trial for Novice out of the Novice A classes. Friday was the first day of the trial, and strangely, I wasn’t nervous. I was pretty confident in Carlin’s ability to find the hidden scent of birch essential oil to qualify in the Novice Exteriors, Containers, and Interiors classes. Novice Buried was last. I didn’t feel quite confident in Buried. In practice, he’s successfully found the Buried hide about 70% of the time–which is not where I like to be when I enter an event. But, I was going to be there. I might as well try anyway. Well, he did great, better than I expected. 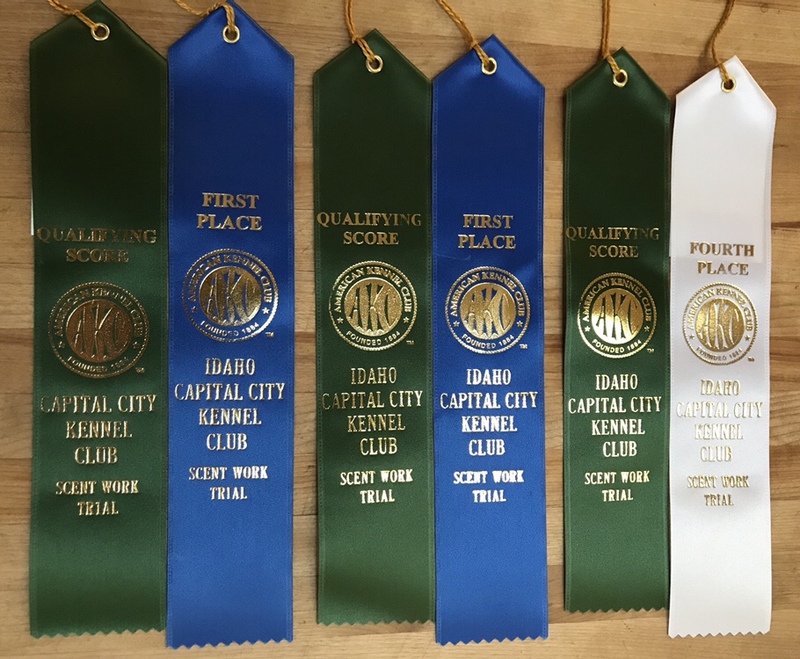 He found the hidden scent in Exteriors in 20.96 seconds, for a 1st place; Containers in 10.41 seconds for another 1st; and Interior in 16.86 seconds for a 4th place. In both Exterior and Containers, he did very little searching, almost as if he knew where the hide was before he even entered the search area. Interiors was a little harder–the hidden swab with a little bit of birch oil was on the bottom of an easy chair. But that chair was right next to an ottoman, so it took me a bit longer to be convinced that I could identify specifically where the hide was, should the judge ask me to show her. Buried eluded us, though. He searched all the boxes of sand several times, and didn’t seem to be able to identify which box the odor was buried in. So, I started to do a directed search by pointing to each box. He sat (his indication that he’s found a hide) after I pointed to the first box, so I called it. But he was wrong. I should have waited and pointed at every box, getting him to search each one again. Saturday. I don’t even remember Saturday except for the end. If the ribbon stickers didn’t say the times, I would not remember them. No 1sts, but overall Saturday was just great. Exteriors in 16.27 seconds for a 3rd place; Containers in 11.12 seconds for 4th place; Interiors in 10.85 seconds for 2nd place; and lo and behold, Buried in 16.99 seconds to qualify. So, we qualified in all the offered Novice classes, I had no handler faults, and Carlin’s times added up to be the quickest of all the dogs (55.23 seconds out of a possible 480, which is 2 minutes per element). 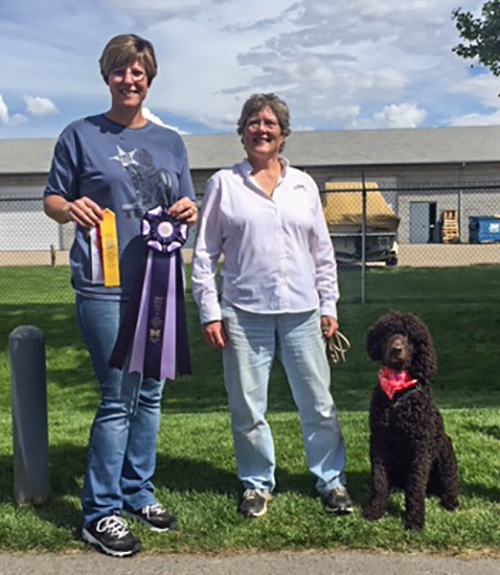 With that, Team Carlin took home the High in Trial ribbon for the day. Sunday poured down rain, but the show went on. I think folks were relieved to have cooler weather, and the dogs didn’t seem to care. And Carlin did pretty well. Exterior in 19.63 for a 4th place; Containers in 8.58 seconds for 4th place; and Interior in 9.28 seconds for 2nd place. Those passes were the third for each of those classes, so that earned Carlin his new titles. And Buried? Well this time, Carlin searched about three of the boxes and then did an enthusiastic sit at one of them with a huge smile on his face. Must like the enthusiastic sit he does for all the other elements. So I called it. But darn it. He was wrong. Or fooling with me. Or just tired. So we didn’t qualify in Buried on Sunday. Oh, and about the no talking? That makes our successes particularly sweet. I had surgery on my vocal cords on May 8th, and I was not allowed to use them. No talking. No whispering. No singing. No yelling. So Carlin and I did all three trials without my talking to him. Just gestures and pointing and facial expressions. Not the way I’d normally like to do to it. But Carlin and I are a team, and there are times we don’t need to talk. Last summer, Tooey found and sampled almost all the ripe melons before we had a chance to harvest them. We just got used to eating around the bites she’d taken. She’d pick one up, take it to a nice shady spot, and have a snack. If it it wasn’t quite ripe enough for her, she’d retrieve another. Carlin got into the act, too. He liked cucumbers and lettuce. So this year, when we replaced the old rotting raised beds with new sheet metal ones, we decided we’d build a fence around them to keep the dogs out. Or we hope it’ll keep them out anyway. They’re not particularly enterprising thieves. For example, they haven’t bothered to figure out how to open the cabinet where the kitchen garbage is kept, and they don’t counter surf (at least yet). Once we get the gate installed (it wasn’t in yet at the time of the photos below), we hope the fence will be sufficient to keep them out. But then we caught them casing the situation, so you never know what will happen once the scent of ripe cantaloupes and cucumbers starts floating through the air.